A short update. This afternoon (February 10) I have once again pointed my ETX-125 with solar filter to the sun to check if something has changed since a few days ago. And that was clearly the case. 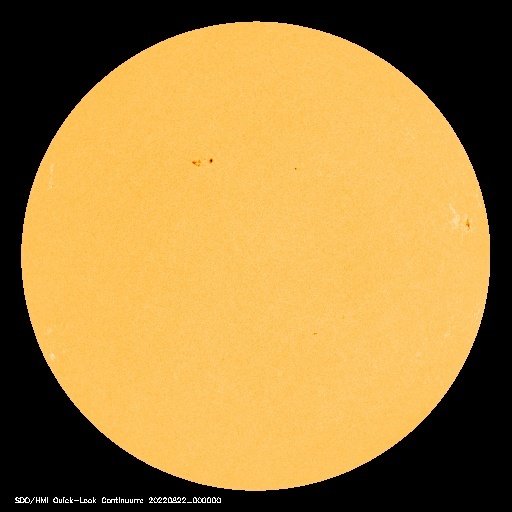 Now there are two groups of sunspots. Both groups were already visible in the picture of last Monday, but the smallest group consisted at that time of 1 small and 1 larger sunspot surrounded by brighter (hotter) spots. The presence of the brighter spots was already an indication of extra activity and apparently this has lead to the larger group that can be seen now. The larger group became in the same time smaller and has changed composition. Unfortunately I was not able to make a picture of the whole sun. I was too late and the sun disappeared behind some trees. The picture to the left has been made with the Meade DSI and is of the same group as in Monday's picture. I assume that brighter spots in this image are artifacts on the sensor of the DSI. The quality of this image is much less than of the one made with the Nikon D90 on Monday.